Part of accountability is taking responsibility for your actions. For me, it is admitting that I am in more control of my nutrition and fitness and how they affect me than I wanted to believe. I had started telling myself that God just made me on the heavy side. That I ate healthy and just didn't loose weight. Being accountable to a group of people doing the same thing made me really realize that I need to measure. I need to track. I can eat extremely healthy, no sweets, no fried food, no red meat, no bread, whatever you want to label it all day long but if it is in the wrong portions in the end my body will still be lacking some things and storing up an excess of others. And I'll get frustrated with the lack of progress. And eat an excess of the things I've told myself I can't have. You have to have measurable goals if you are going to give an account of your activity to someone else. 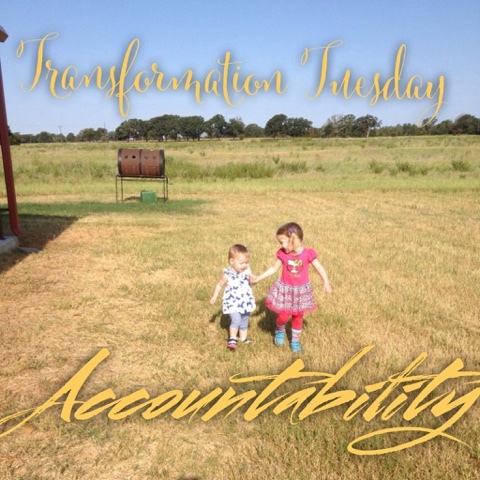 I find all that is a lot easier when everyone is on the same page (I've been in accountability groups where we were all doing the same thing, like 21 Day Fix, and I've been in accountability groups where everyone is doing their own thing). And you can commiserate! Mixing bowls are awful ... yeah those hurt for me too! You can laugh together. Seeing that another person in the same group already made it through that exercise today gives you the little boost that says "I can do it too!" When everyone is doing their own thing it just doesn't have the same effect. Maybe my average rest day day looks like someone else's movement goals ... seeing I already did what they are trying to get in makes my workout seem take-it-or-leave-it. I might share this amazing recipe for oven-fried chicken and waffles ... but to the person following the Atkins diet it is a train wreck. Sometimes accountability is hard. You have to be vulnerable. I FINALLY several months ago owned up to hiding a bag of candy corn. It's embarrassing. But it's me. Around Halloween I NEED HELP people. Accountability won't help you lose weight if you hide under your desk eating cheese all day and pretend you don't understand why the changes you are purporting to have made aren't working. It is hard when you have to be the bad guy. Hey friend, I think you aren't seeing results because, well, you are doing your workouts half-heartedly and, well, those cheat days are adding up. Ouch. And you get out of it what you put into it. If you don't participate in an accountability relationship, more likely than not they aren't going to chase you down. In the end, you are helping one another up ... but to quote Autumn ... "There is no magic pill. You've got to do the work." Lastly, accountability works best when there is someone ahead of you, even if just barely ahead of you, who has already been there. The Beachbody programs I've done (21 Day Fix and Hammer & Chisel) have made that so easy. Coaches like me have already done the program and can help get you into a group where we are all on the same page. It's what has worked for me. And I don't even have to leave the house.